Erewash residents have the chance to watch a historic Beating Retreat and Sunset Ceremony with the Nottinghamshire Band of the Royal Engineers in Ilkeston Market Place to commemorate the centenary of the end of the First World War. The colourful ceremony is on Tuesday 19 June and promises to be a moving spectacle for people of all ages, giving residents the chance to turn out and support the armed forces event and remember those who lost their lives in war. Beating Retreat is a military music ceremony performed in some form by most armed forces in the Commonwealth. Its origins date back to an old Army custom of ‘watch setting’, when a gun was fired at sunset to mark the end of the working day. The later formation of regimental military bands developed this ritual into today’s pageant-style Beating Retreat ceremony. 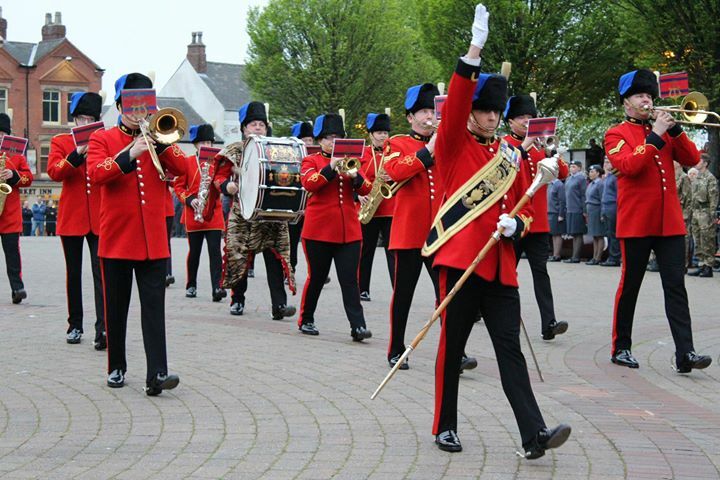 A display of military vehicles and stalls by veteran organisations will be in the Market Place and there will be performances by Ilkeston Brass and the award-winning Long Eaton-based ladies barbershop chorus GEM Connection from 6.15pm. Beating Retreat with the Nottinghamshire Band of the Royal Engineers will then begin at 8pm, with the band marching in the Market Place while performing a popular music programme before the beating of the drums at sunset to close the ceremony at 9pm. “What a privilege and honour it will be to welcome the Nottinghamshire Band of the Royal Engineers to our borough and to see this historic ceremony performed in Ilkeston. It will be a particularly poignant and moving event for residents and military personnel alike, with 2018 being the centenary year of the end of the First World War. The Mayor will be joined at the event by the Lord Lieutenant of Derbyshire, Mr William Tucker, and other civic dignitaries. It is the third time the historic Beating Retreat will have taken place in Erewash – military bands visited Long Eaton in 2016 and Ilkeston four years ago for the ceremony.